So I pretty much think I have the best pets in the world (who doesn't?). 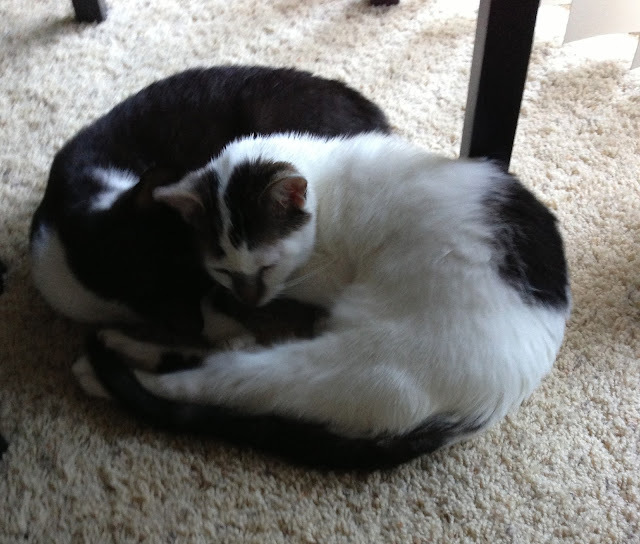 My little screwballs, Rex and Sami, are from MeoowzResQ, a cat and kitten rescue group based in Orange County. I fell in love with them—especially Rex—the minute I saw them. Today's pet paws nail art is inspired by Rex and Sami, who are now five months old. My base color is three coats of OPI Funny Bunny, a not-quite-sheer white polish. It took three thick coats to get the opacity that I wanted, but since I was going for more of a jelly look, I opted for this one over Alpine Snow. Using my large and medium dotting tools, I made different sized kitten paws all over the nails. If you're looking to add a cat or kitten to your family and you live in Southern California, I really urge you to check out MeoowzResq. The women that run the organization have some really amazing animals that need homes. If you're not quite ready for a permanent addition, I recommend looking into fostering, which is what my husband and I did. wowow! so adorable! the paws are cute!